QED Group’s Innovation and Data Hub believes it is essential to simplify data and information through visual communication and therefore, has a team of experts for data visualization. Effective data visualization enables decision makers to easily detect trends, make correlations and identify new patterns for projects. QED Group analyzed data from Uganda’s Sustainable Comprehensive Responses for Vulnerable Children and Their Families (SCORE) project and generated a visualization for USAID/Uganda in the form of a Sankey Diagram that mapped the distribution of vulnerability levels among households. 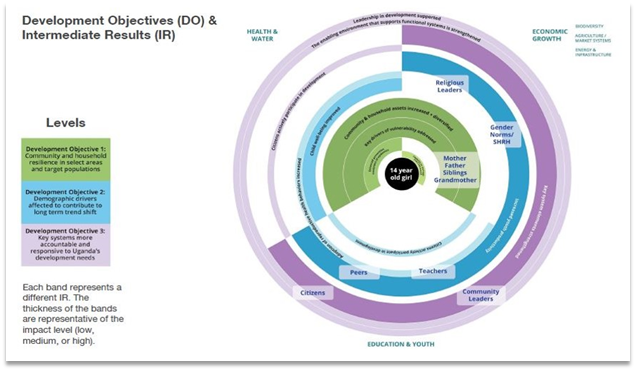 QED Group used data visualization to showcase USAID/Uganda Learning in the Program Cycle and the Performance Management Plan (PMP) cycle. QED Group has also used interactive visualizations to illustrate USAID’s/Uganda Development Objectives (DOs) and Intermediate Results (IRs). Click on the image to explore the visualization!